I just made my first sale on Merch by Amazon! The amount might not be much, but the great thing is that I did not invest any capital to buy stock of this T-shirt. I simply uploaded a design using a free stock image downloaded from the Internet that is free for commercial use with no attribution required. Merch is Amazon's print on demand platform. You upload T-shirt designs, select the cuts and sizes (men's, women's, kid's), and colors that will be available. Your T-shirt design is then listed on the Amazon marketplace. When anyone buys the T-shirt, you earn royalties as the design owner. FREE! There is no upfront cost! All you need to do is upload designs that fit into Amazon's template. There's no monthly subscription fee for a Merch account, and no capital is needed to order physical products. 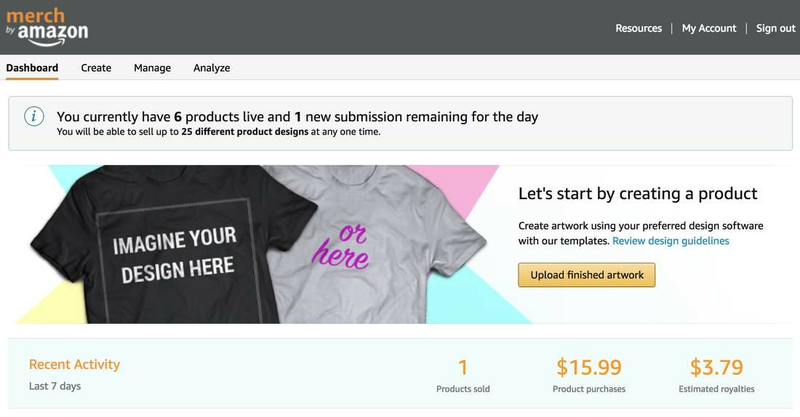 All you need to do is open a Merch by Amazon account, then upload your designs. You are paid royalties for each sale, and Amazon takes care of the printing and fulfilment of the orders. The main negative about Merch is that it can take some time for your account application to be approved. This can take anywhere from a few days to several months. There is apparently a waiting list and I was approved about 2 months after I applied. The solution is to submit your application as soon as possible, then wait for approval. You can apply at merch.amazon.com. There are many ways to get designs. You can DIY or outsource. I have gotten my designs from free online stock images or simply made text only designs. I don't have and don't know how to use Photoshop so I use Canva. You can also outsource to freelancers on Fiverr, or buy designs from https://merchready.com/. If you had to choose one option only, I would go with the Proven Live Merch Workshop.